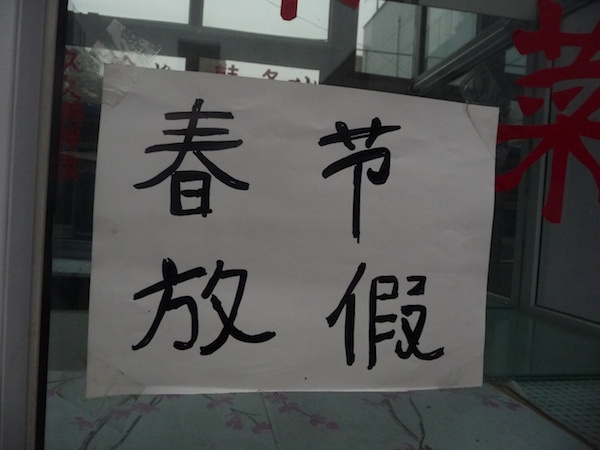 A sign in Beijing's Caochangdi reads "On vacation for Spring Festival". Chunjie aka Spring Festival aka Chinese New Year is here! It was my first month in China last year, and I had just moved to Beijing. I vividly remember dropping off my roommate at Beijing airport for her own participating in Chunyun–the elegant word-pairing that sums up the largest annual human migration on earth–and then taking the elevated Airport Express line back to the city. 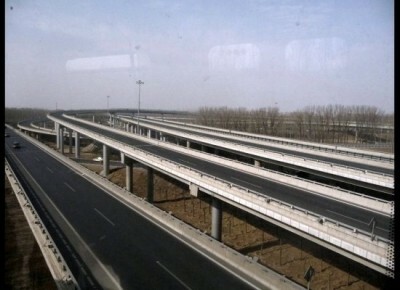 A shot I took of the empty Airport Highway in Beijing during Spring Festival 2011. From above the city and its famous ring roads, I was awestruck. I’d seen New York’s Broadway Ave. empty out for Thanksgiving and Los Angeles’s 405 lighten up on Christmas Day, but I’d never before seen entire highways–just days before clogged with incomprehensible traffic–empty but for one or two cars. I quickly snaped a few images for a short photo essay. It would be my first real introduction to the magnitude of Beijing’s migrant community. I spent the rest of 2011 living and working in Caochangdi, an art village and migrant community just outside Beijing’s Fifth Ring Road, and I got to know the families and young men and women who traveled to the city from all over China with the hopes of improving their opportunities in life as the country marches toward urbanization. Which got me thinking about a film I have to recommend strongly to 88 Bar readers. Lixin Fan’s Last Train Home (归途列车) is a narrative documentary focusing on one rural Sichuanese family, the Zhangs. For 16 years, Mom and Dad Zhang have been working in Guangzhou, leaving behind a son and daughter to be cared for by their grandparents. The film starts with the couple making the annual trek home for Spring Festival alongside some 300 million others. It then follows the awkward reunion with their son and teenage daughter. Set amidst stunning scenes of the Yangtze River, garment factories and the overworked train system, Last Train Home gives us a rare peek inside the personal struggles of one migrant family. One didactic scene, when one worker waxes poetic about the difference between Chinese and Western standards of living, serves less to preach to viewers and more to show us that the armies of workers who make our clothes and iPhones with record efficiency are living, thinking human beings. And they’re no fools about the new world order brought about by globalization. What’s important about this film is that it shows the very human side of this mass migration. It can be fascinating to rattle off statistics–690.79 million people living in cities, 3.2 trillion US dollars’ worth of foreign reserves, 2 billion square meters of new buildings each year–but in so doing, it’s easy to forget the people caught up in what is inarguably an historic moment for the country and the world. ◆ An Xiao Mina is a design strategist, new media artist and digital community builder in the Pearl River Delta. She uses technology to build and empower communities through design and artistic expression.